A Record-Shattering 5 Days at Sandy Point! Northern Parulas were certainly the “bird of the week” at Sandy Point. It was a special five-day run at Sandy Point Beach on Cousin’s Island in Yarmouth. It was a record-shattering run in fact, in which I tallied nearly 18,000 migrants engaging in the “Morning Flight,” or “morning re-determined migration” when nocturnally-migrating passerines relocate (to drastically oversimplify things) come sunrise. I’ve had a handful of four-day runs, but I cannot think of a time when conditions were favorable – and I was actually present, and not leading tours on Monhegan for example – for five straight days. But I have most certainly never had five days like this! I recorded 72 species “deemed migrating” through here, not including migrants that were in the bushes, such as the Gray Catbirds and Song Sparrows that are so abundant in the brush here. It does not include species like Osprey, in which some of the many I saw this week were likely southbound, but impossible to separate from the still-locals. And this tally did not include all of the waterbirds, from Common Eiders to herds of dabbling American Black Ducks, and from Bald Eagles to hunting Great Blue Herons, as well as resident species. I tallied 25 species of warblers, including a single Connecticut Warbler, one of the most sought-after parulids in Maine. A Northern Mockingbird was only my 5th ever noted here, and two passing Dickcissels are always a treat. But certainly the icing on the cake of this great week was the Lark Sparrow found by the group in the parking lot on the relatively quiet morning of 9/13. This was a first record for Sandy Point, and my personal 184th species here. But it was the morning of the 11th that will go down in Sandy Point history! 8,185 migrants was not only a new record, but almost doubled the previous record (4,346 on Sept 21, 2010). It was incredible. More on that epic morning later. A number of records for high counts for individual species were set, and I am sure even more would have been shattered if I had a higher rate of identification during the onslaught of the 11th. Other trends, typical of the season, were evident, such as the slow but steady change in the composition of the flight. The early migrants like Magnolia Warblers were giving way to a growing percentage of Yellow-rumped Warbles and Blackpoll Warblers for example. But it sure seems like we’re not yet running our of Yellow Warblers and American Restarts, however! So first, here’s the numbers (bold font indicates a new daily record). Now, let’s take a look at the radar. Here are the density and velocity images from 1am (as a sample) on 9/9 and 9/10. 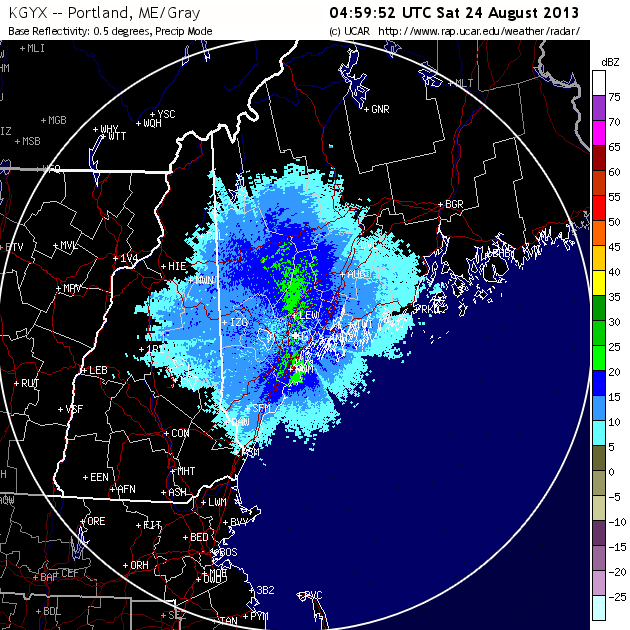 That’s a ton of birds on the radar. And even as late as 4:00am on each day, a lot of birds were visible, and a lot of birds were offshore. 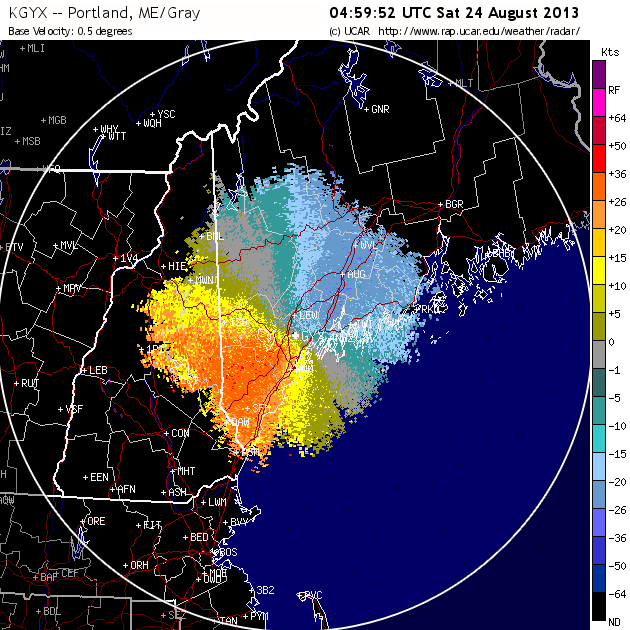 The night of 9/8 through 9/9 featured light westerly winds, shifting to northwest by sunrise. And on the next night, light north winds became northwest overnight. Both, as expected, produced great flights over and through Sandy Point some dawn. Weather patterns, especially at this time of year, rarely produce three great nights for migrants in a row. And when they do, it often results in fewer birds overnight (and therefore at Sandy Point) come sunrise; essentially, the well temporarily runs dry. And as you can see by the 1:00am radar image from September 11th, the density was nowhere near the previous two nights, despite mostly light westerly winds overnight. And by 4:00am, it was rather quiet. Light northwesterly winds in the evening slowly gave way to light north, before becoming light and variable. After midnight, they became west but didn’t really increase until after 2:00am. Coupled with a lackluster radar return, this was not a recipe for a huge flight. Nonetheless with a light westerly wind at sunrise, I was heading to Sandy Point anyway. If only because it was a day off, and I won’t have many more chances to visit “my office” this month. A milky sunrise further clouded (sorry) my optimism for a big flight, but there were plenty of birds in the air. It was incredible. It was frustrating. It was beautiful. It was painful. It was amazing. It was indeed overwhelming, and at times, my only hopes at quantifying the flood was to skip attempting identification and just click my unidentified clicker as fast as I could. And I really can’t explain it. It “shouldn’t” have been this amazing. With light westerly winds come dawn, I was once again stationed at the bridge, and what was – prior to three days ago! – considered a very good flight passed over and through. It was even downright relaxing – and manageable – after the chaos of the previous morning. I had fun. Not surprisingly, after four consecutive nights, the flight was much lighter overnight on the 12th into the 13th, as evidenced once again by the 1:00am and 4:00am images. And despite very light westerly winds in the morning, and clear skies, only a light flight was to pass through the point. Of course, that Lark Sparrow more than made up for it. It was also nice to enjoy a slower flight – and identify many more birds than not! 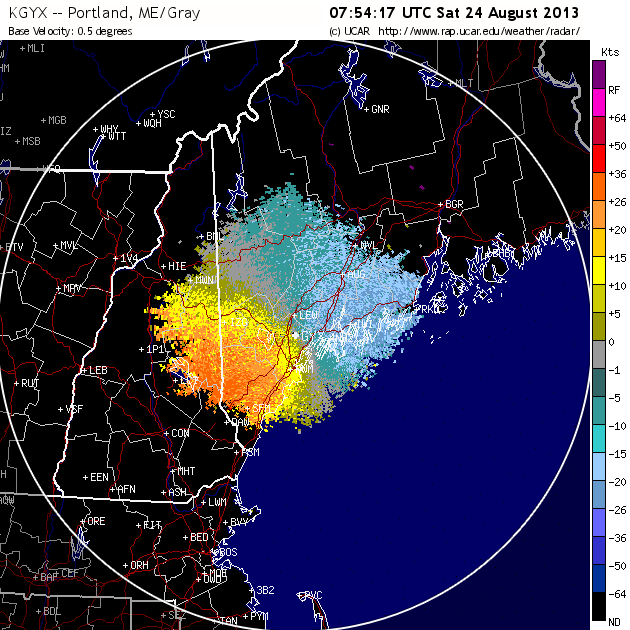 So almost every morning made sense: radar plus weather conditions correctly predicted the intensity of the flight. Except for one. The Big One. And I can’t explain it. But, I am OK (mostly) with that – it’s one of the fascinating and flabbergasting aspects of documenting the morning redetermined migration! Winds turned to the south during the day on the 13th, and continued light and southerly overnight, bringing the streak of five great nights of migration to an end. Come morning, I also slept in – relatively speaking – and then went for a massage. As my therapist began to work on my aching neck, she simply uttered, “Wow” and got to work. I felt the same on Monday morning when the greatest flight I have ever recorded passed through Sandy Point. Species, such as this Swainson’s Thrush, that can be rather secretive in migration, are sometimes seen really well at Sandy Point! This entry was posted in Birding in Maine, Morning Flight and tagged "Birds, American Redstart, Birding, Connecticut Warbler, Cousins Island, Dickcissel, Lark Sparrow, migration, Morning flight, Northern Parula, Sandy Point, Sandy Point Beach, Swainson's Thrush, Yarmouth, Yellow Warbler on September 14, 2017 by Derek. I definitely had second thoughts when the alarm went off at 4:45 this morning. I hate pre-5am alarms. But August flights at Sandy Point Beach, Cousin’s Island, Yarmouth can be so much fun. I just wish dawn didn’t come so darn early right now. 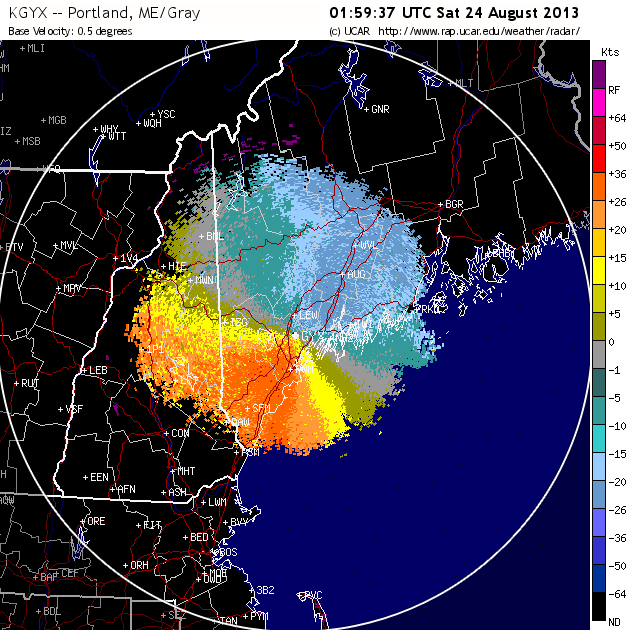 But as of 9:30 last night, the NEXRAD radar was absolutely on fire! Light northwest winds and clear skies really put birds on the move. Here are the 10pm, 1am, and 4 am radar and velocity images for example. For a detailed explanation of how to read and interpret these images, see Chapter 5 of my book, How to be a Better Birder. This was really an exceptional flight for this early in the season. But back to that alarm clock…I woke up, and saw that the winds had become northerly overnight. The lack of a westerly component usually diminishes the Morning Flight here. However, with that high of a density on the radar, even as late as 4:00am, I figured I would give it a go, despite serious contemplation of rolling over and waiting until the next cold front (and waiting for a few more minutes of darkness). Let’s just say I was glad I motivated. Come sunrise, a little northwesterly to westerly breeze at the surface developed, and encouraged more birds to cross at the point. The winds were very light, so a lot of birds were high; the trees and shrubbery were fairly quiet this morning. Therefore, with so many high birds, and some big groups just too far to the north of the bridge, my “unidentified” tally was higher than I would have liked. 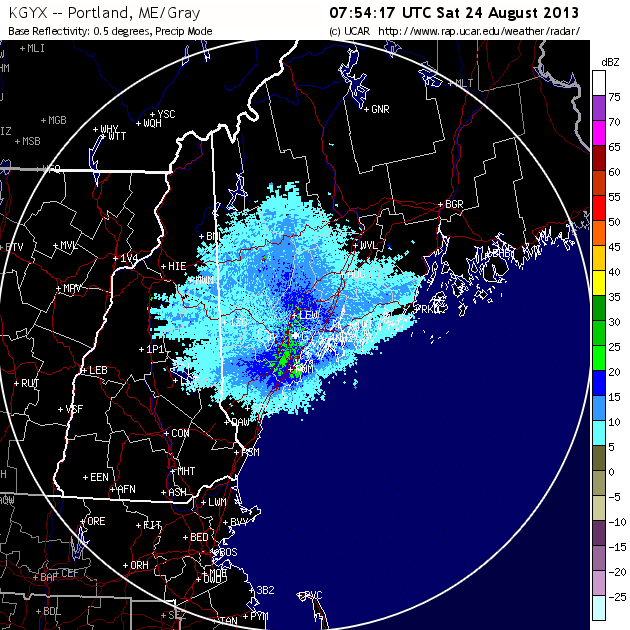 This entry was posted in Birding in Maine and tagged American Redstart, Birding, Cousins Island, migration, Morning flight, NEXRAD, radar, Sandy Point, warblers, Yarmouth on August 24, 2013 by Derek.